As the 2016/17 President of the Sydney University Business Society, I have worked closely with both the University of Sydney Business School and with large corporate sponsors to arrange and promote the endless co-curricular opportunities that are on offer to our highly motivated students. 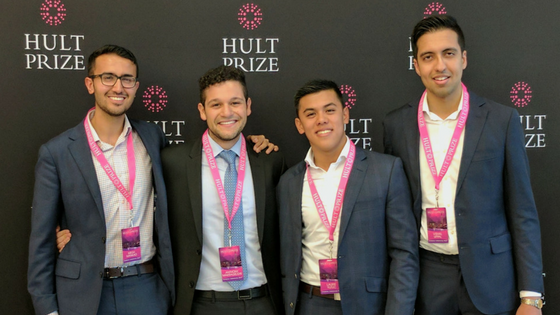 Of particularly note was SUBS partnering with UBER and Commonwealth Bank to present the Hult Prize Case Competition – an internationally-run student competition that encourages students to build social enterprises to address pertinent world problems. This year, the question centred on the Refugee Crisis; specifically, how we can restore the rights and dignities of 10 million Refugees by 2022. Seeing the tangible difference this opportunity presented, alongside Laurie Yutuc, Vishal Uppal and Megh Mankad, we decided to participate. Our team were beyond words when it was announced that we had been selected (out of 50000+ applications) to compete in the Regional Finals in London in March, 2017. In fact, the University of Sydney made international history this year, being only one of four universities to have teams selected to present at all 5 Regional Finals locations (San Francisco, Boston, London, Dubai and Shanghai) globally. Our social enterprise, Hiraeth, is a licence-based platform that operates as a series of profit-driven conventions, sharing ‘The Refugee Story’ in new and immersive ways. Infusing traditional performing art mediums such as dance and theatre with innovative technologies such as augmented reality, Hiraeth allows refugees to meaningfully connect with their new home. In turn, each convention reinvests revenues to support impact-driven initiatives that enhance the lives of millions of refugees from where these stories originated; to empower those who have not been so fortunate in their reaching their destination. From our team at Hiraeth, we'd like to thank the University of Sydney Business School for their endless support and guidance throughout our journey and for making it possible for us to compete in such a rewarding and internationally-recognised student competition. By Anthony Makris, current student at the University of Sydney Business School.